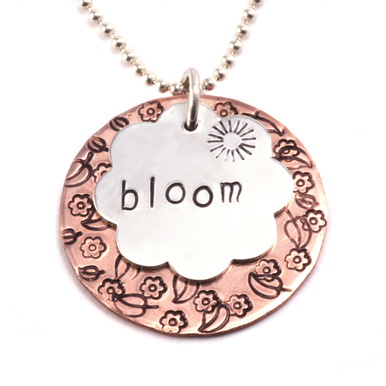 A simple stamped rectangle necklace is all the rage right now! We see it on tv, we see it at the mall, we see it walking down the street, and now you can see how to make it! Wanna save time? Many of our rectangles have holes already punched in them. Beaducation Wackadoodle Uppercase Letter Stamp Set 1/8" (3.2mm) - $135.00 - we used the L from this set in the Gold Filled sample. Aluminum Rounded Rectangle, 45mm (1.77") x 10mm (.39"), 18g - $0.85 - we used this blank in the "M" sample. Gold Filled Rectangle Bar with Holes, 30.5mm (1.20") x 5mm (.20"), 20g - $7.47 - we used this Gold Filled rectangle for the "L" sample, but this necklace looks great with any size rectangle from any metal. Gold Filled Drawn Cable Chain 3.5mm x 2mm, by the Inch - $0.67 - 16 inches.